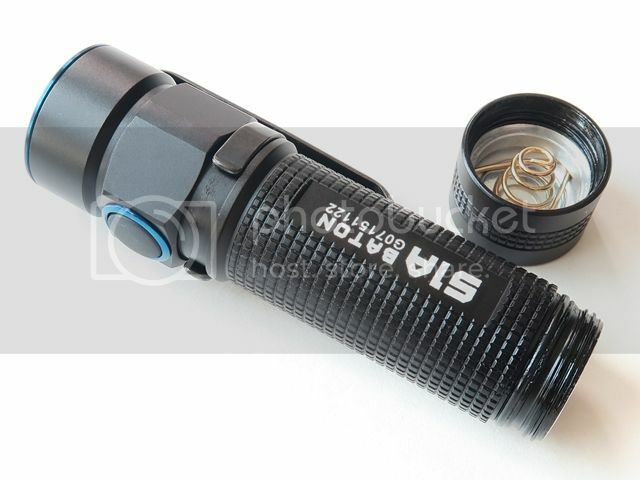 The S1A, S2A from Olight have been released with all "TIR optic and side switch". These are to give you intended throw with minimal spill and not only control on-off but perform mode changes. I will start out with S1A, then the S2A. The S1A comes in clear plastic container. 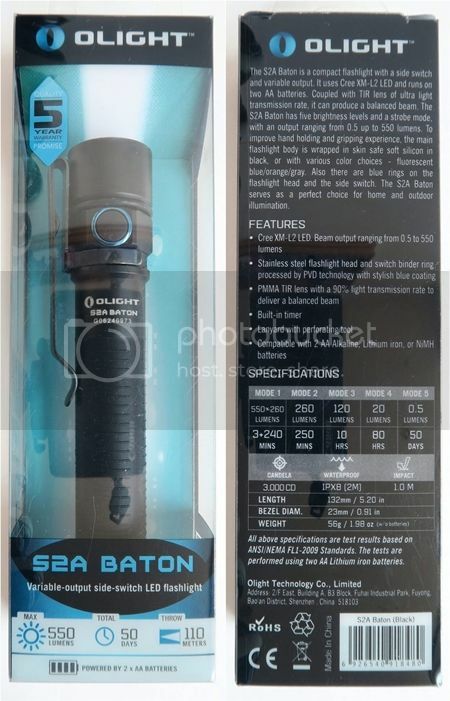 There is an overview of features on the front and back of the packaging. 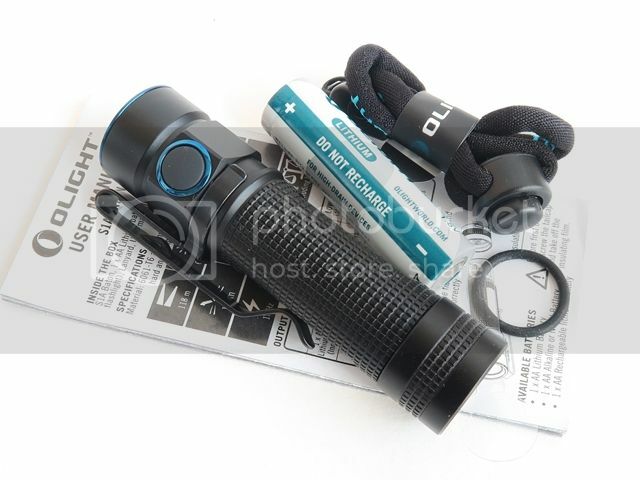 The light comes with removable pocket clip (attached), spare o-ring, wrist lanyard, 1xOlight lithium AA battery, user manual. The S1A is quite small for its class. 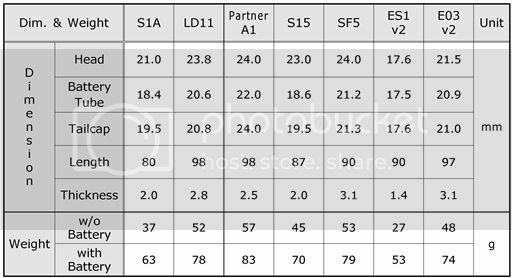 Overall build is quite similar to the S1 Baton I reviewed. The hard(type III) anodizing is a matte black and no flaws on my sample. All labels are sharp and clear in bright white against the black background. The raised checkered pattern is present over most of the body. The light has no tail switch. Fit and finish look very good. 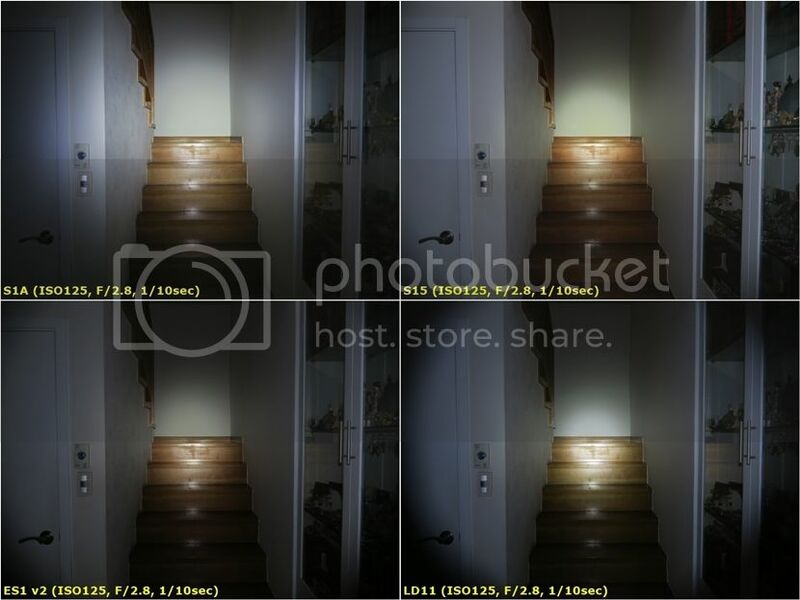 You can use 1xAA (1.2V Ni-MH or 1.5v Alkarine or 1.5V Lithium or 3.7v Li-ion rechargeable battery) in the light. The light has 2 parts. The body is one piece with the head (i.e., the body has a built-in head). The pocket clip and side switch work as a good anti-roll device. 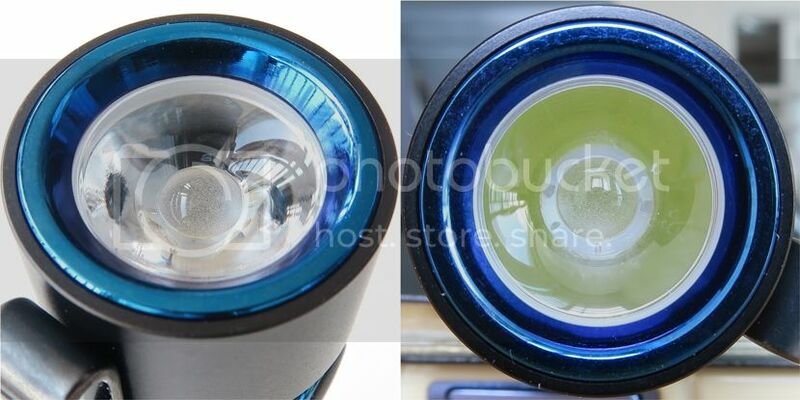 The light has a blue flat stainless steel bezel ring. 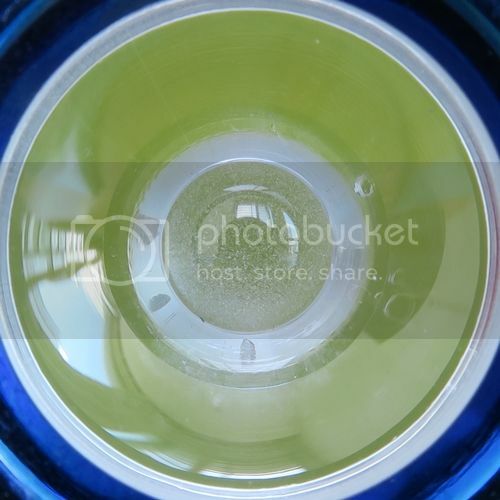 The head has a clean looking cylindrical design with a hex-shaped neck which provides grip. There's an electronic side switch just on the neck. The side switch is silicon, and it has a good feel to touch and has short travel, which produces the same clicking sound as the S1. Like the S1, the S1A switch protrudes slightly, so the risk of accidental activation is not high. There's no low-voltage warning indication on the side switch. 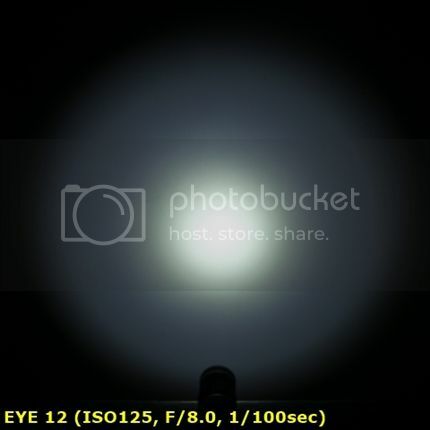 The light has a deep-set positive (+) battery contact in the head. 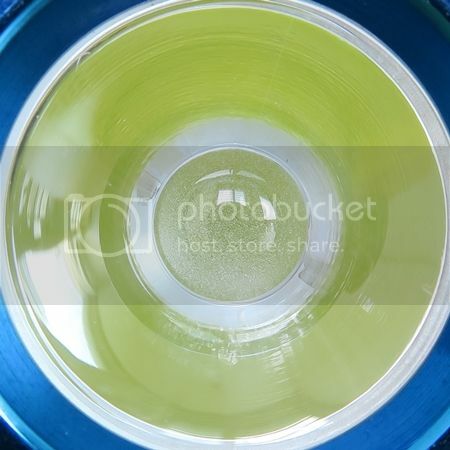 There is also a black plastic disc surrounding it, which acts as physical reverse-polarity protection feature to protect from incorrect battery installation. So flat-top cells will not work in the light. 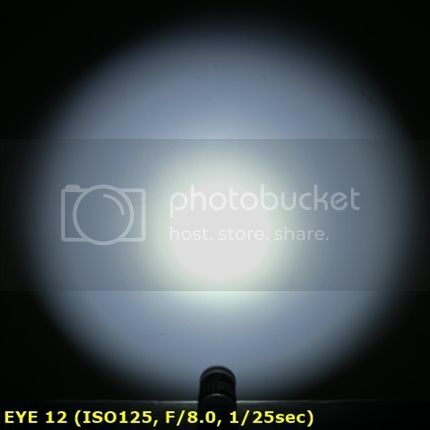 The light uses a PMMA (Poly Methyl MethAcrylate or Acrylic Glass ) TIR lens without a reflector. The fit and finish look good. 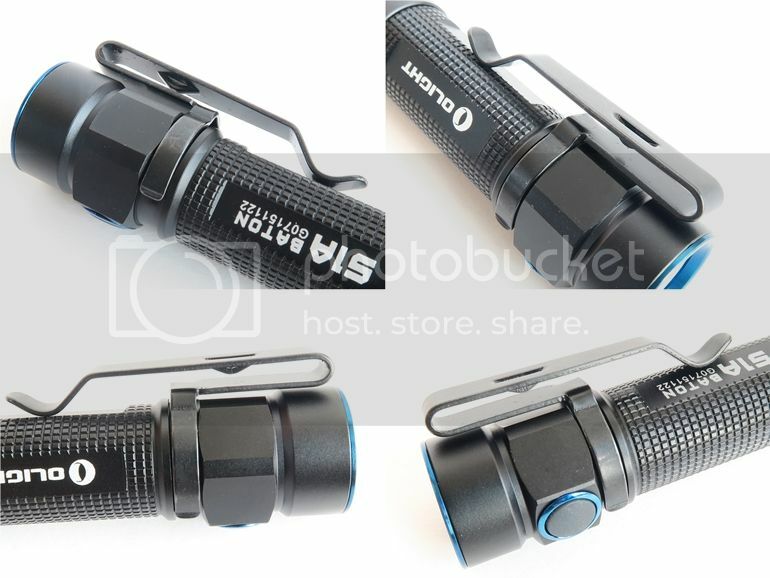 The pocket clip looks sturdy and hold onto the light very securely. It is reversible, allowing both bezel-up or bezel-down. 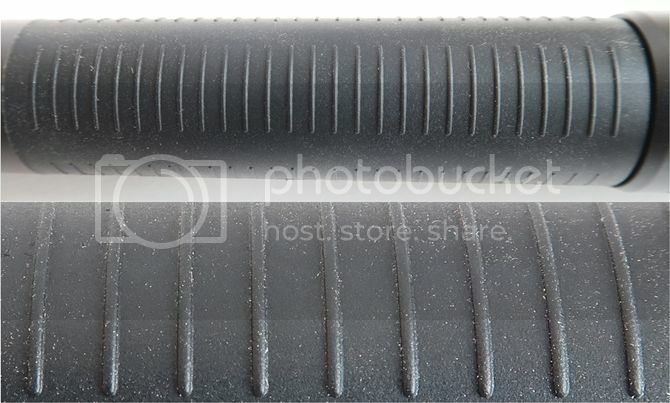 The battery tube (i.e., body) is mostly covered in raised checkered portions with three flat faces where manufacturer, model name are printed on, and one of the flat faces where the clip is touching. With the pocket clip attached and other shapes on the head, overall grip is good. The wall thickness of the body is 2.0mm. The light feels solid. 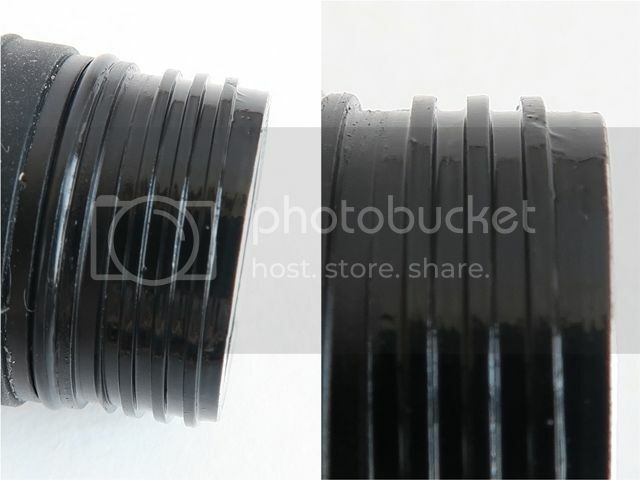 The screw threads are square-cut of good quality. 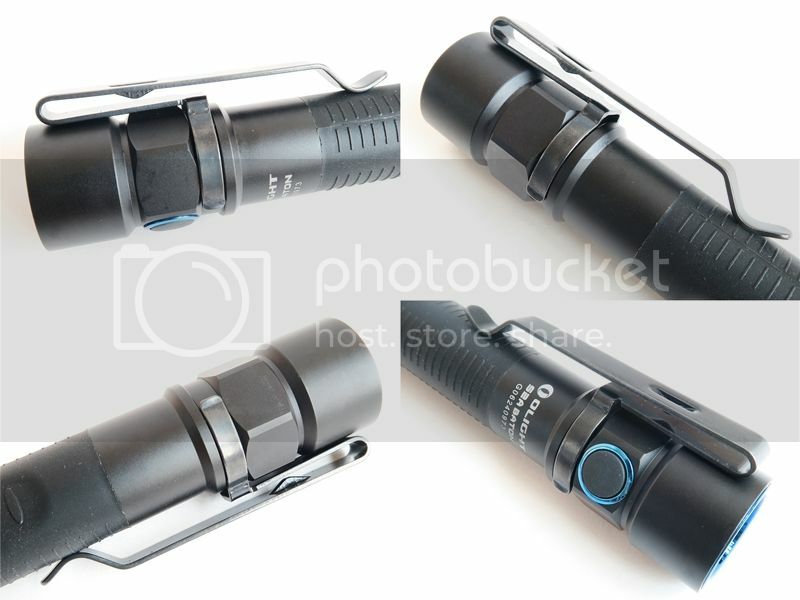 Threads are well machined, and anodized which allows the light to be locked-out when the tailcap is slightly loosened. As supplied, threads are well lubricated. Screw threads action is smooth with no cross-threading or squeaking in my sample. 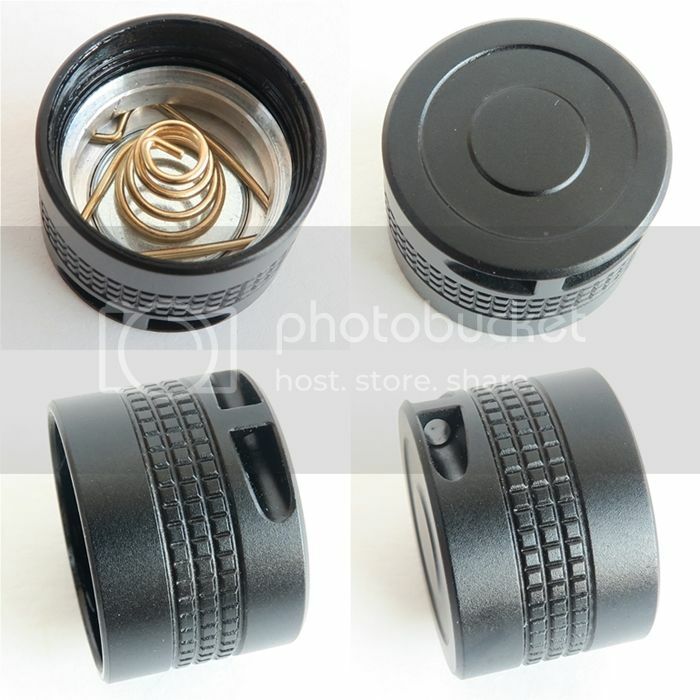 There is a removable negative (-) spring come with a removable strong magnet on the inside of the tailcap. 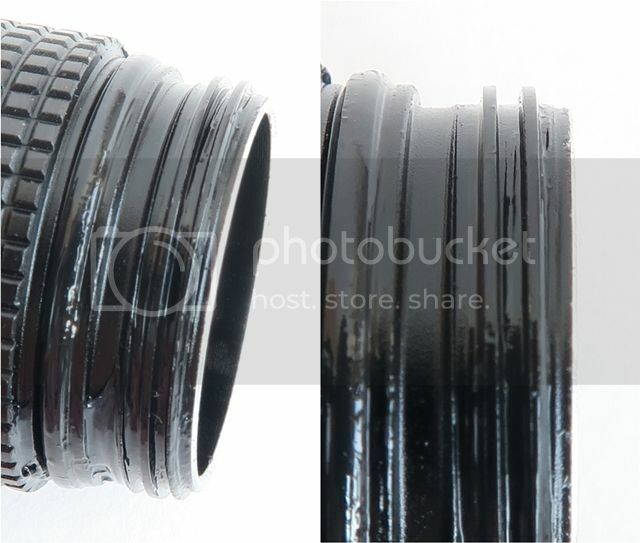 There is tiny hole on the side of the tailcap for lanyard or split-ring attachment. The magnet pull is strong, so it does pick up the battery through the negative spring, because the spring and the magnet are actually in contact. 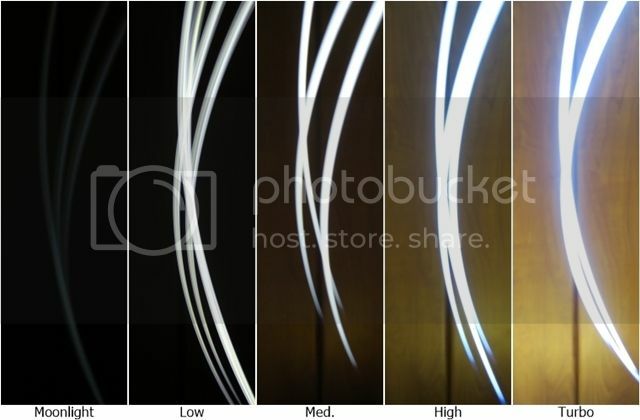 The light sticks to all the metal objects made with steel. 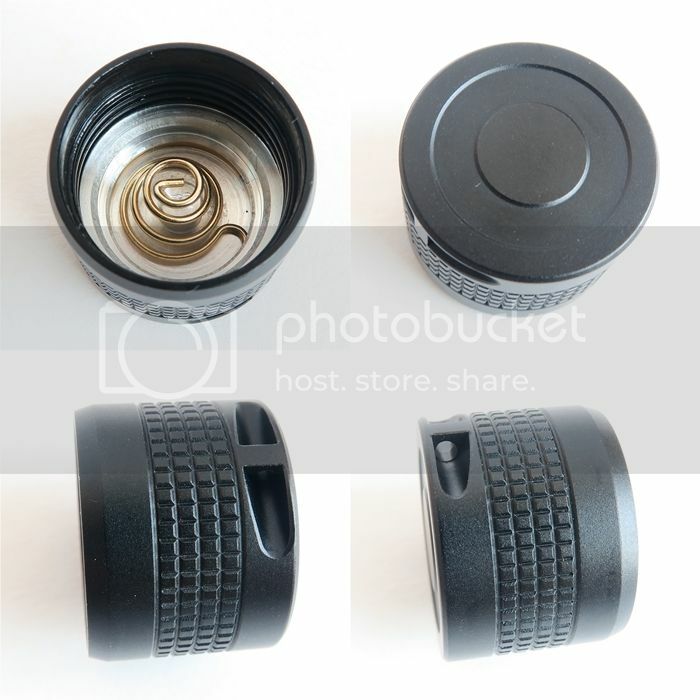 If you don't want the magnet, you can remove it (i.e., you can take out the magnet by releasing the spring holding the magnet in place by prising the three edges of the spring out from under the recess on the tailcap). There is a raised checkered portions band on the tailcap. The S1A can tailstand stably as expected. On-Off and output switching is controlled by the electronic switch. A quick press and release turns the light on, and another quick press and release turns the light off. When on, holding down the switch will proceed Low -> Med. 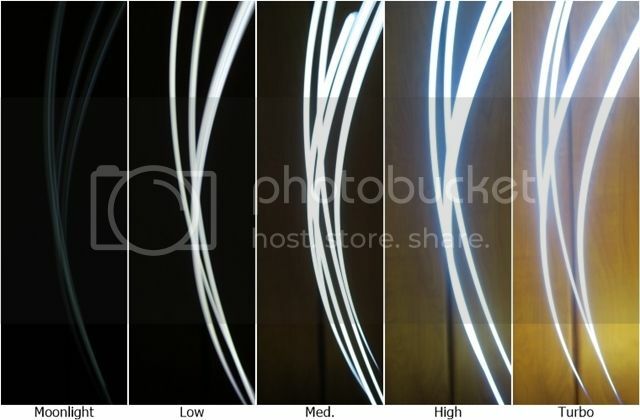 -> High -> Turbo (only available on a rechargeable Li-ion cell), in repeating sequence. To select your desired mode or output level, just release the switch. The light has mode memory, and remembers the last output level used when you turn the light off and back on, even after a battery change. You can access Moonlight directly from "Off" by a sustained press of the switch for about 1.5 second. This means Moonlight is a separate mode from the above Low, Med. High, and Turbo. You can always turn the light on in the lowest possible mode if you want (i.e., no matter where you memorized it before). Mode cycling and memory works as before, once on. 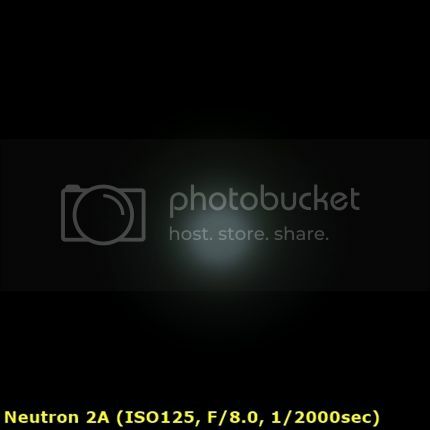 Double quick click from Off will activate High or Turbo (only with a rechargeable Li-ion cell) directly. 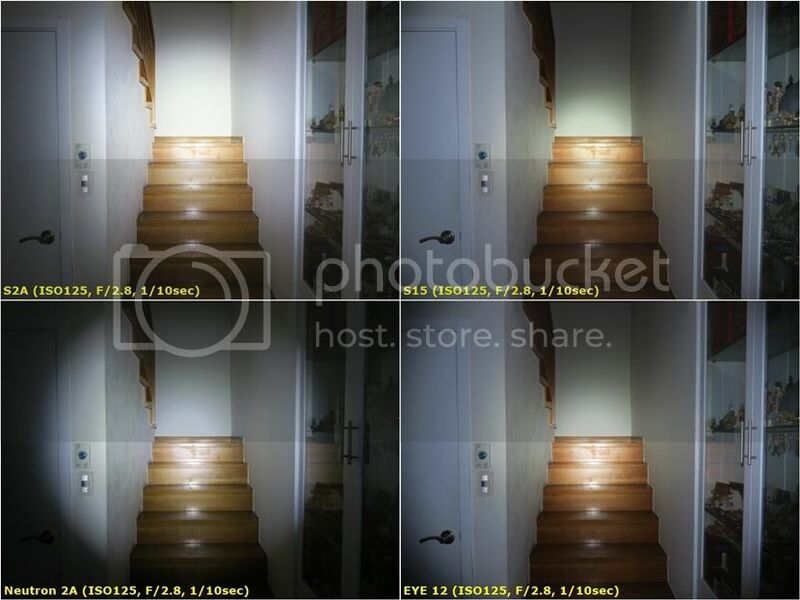 The “hidden” Strobe is accessed by triple-clicking the switch whatever mode the light is on (even Off). A single sustained press of the switch will return to the previous output level in general mode. The strobe has no memory. The distinctive aspect of the light is a timer setting function. Double quick click from On will activate "3 mins timer" which is presented as single flash. Another double click from On will activate "9 mins timer" which is presented as two flashes. You can swap between 3 mins and 9 mins timer setting by a double quick click. The light will automatically shut off once the timer is over. 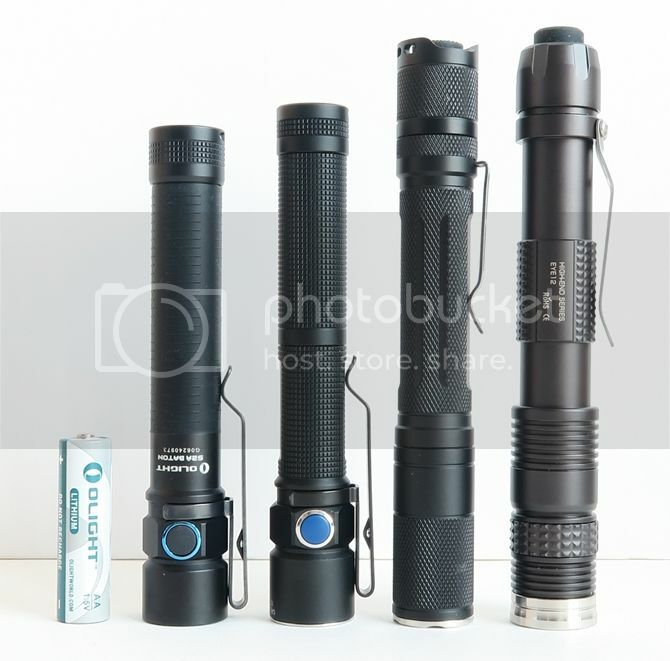 From left to right, Olight Lithium AA, Olight S1A (XM-L2), Olight S15 (XM-L2), Xeno ES1 V2 ( XP-G2 R5), Fenix LD11 (XP-G2 R5). 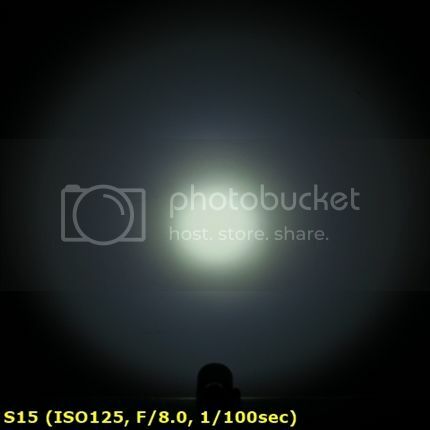 Due to the electronic side switch interface, the S1A is drawing a small current when the light is fully connected. 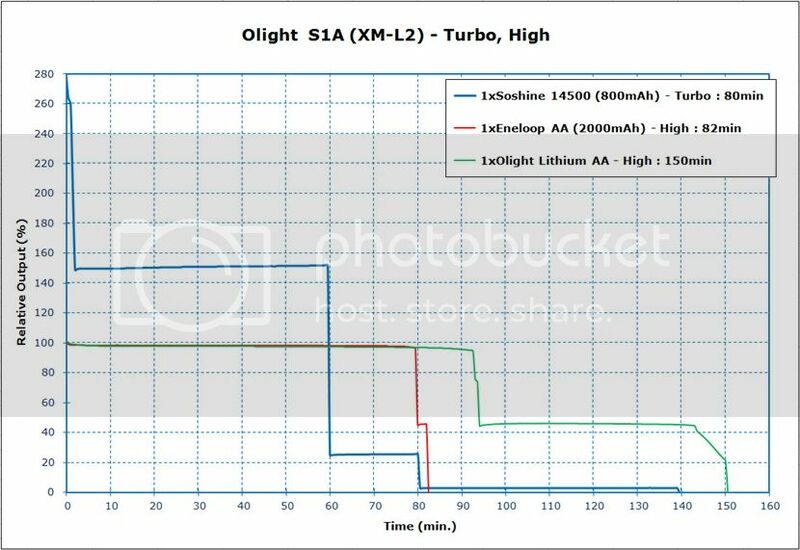 I measured this current as 1.7μA and 5.5μA on Eneloop AA (2000mAh) and Soshine 14500 (800mAh) respectively. That would translate into around 134 years (Eneloop AA 2000mAh) and 16 years (Soshine 14500 800mAh) before it would be fully drained. This is quite negligible, not a concern. But I would recommend you to store the light locked-out when not in use for a long time or to prevent accidential activation. The S1A is compact and small. 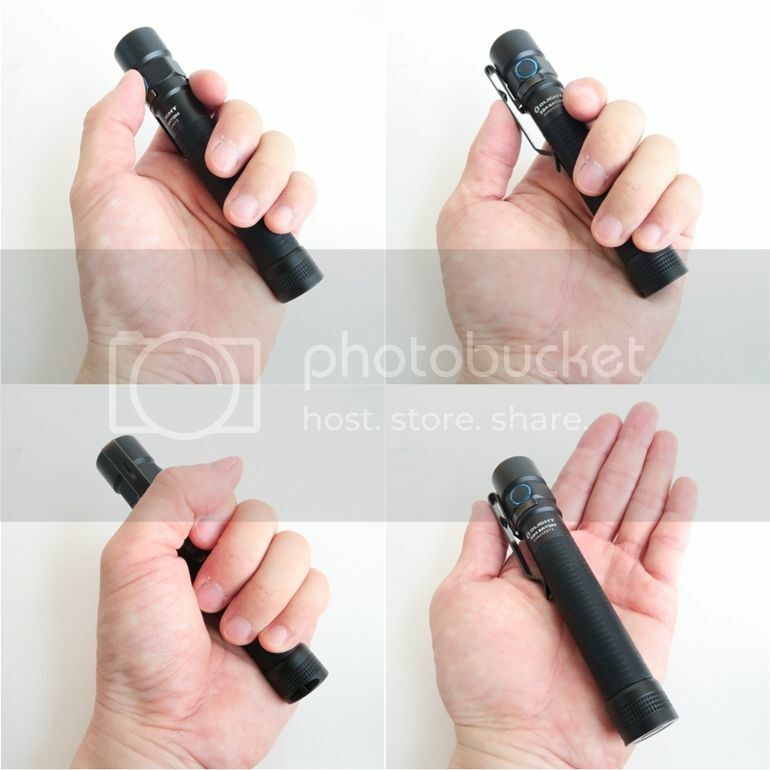 It is really good size to hold and use. 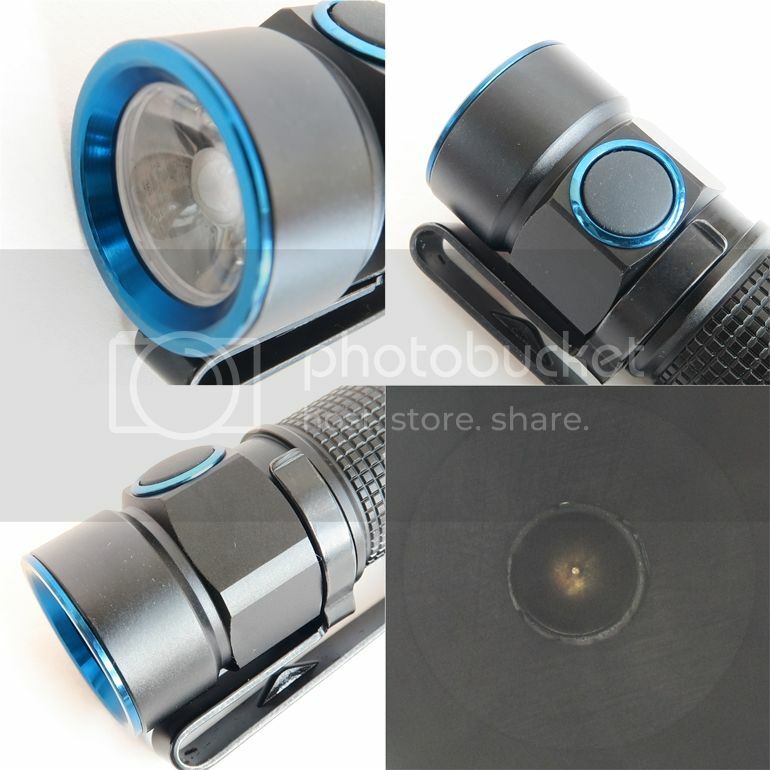 You can use it as an 1xAA EDC light. Overall build quality is excellent. The light shows no sign of PWM at all output levels with 1xEneloop AA. I notice there is no buzzing sound at any levels. 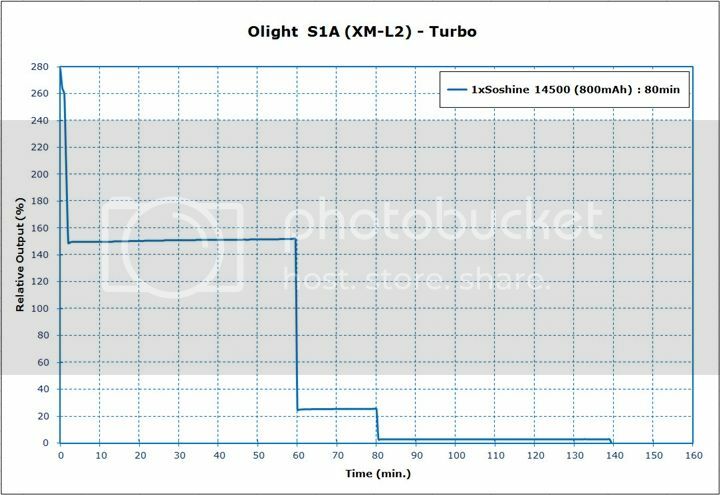 The light shows no sign of PWM at all output levels with 1xSoshine 14500. I notice there is no buzzing sound at any levels. S1A starts to step down gradually after 1 min runtime, and level off to around 54% of the initial output after 2 mins on 1x14500. This seems to be a timed drop-down, not a thermal sensor feature. Note that you can turn the light off-on to restore initial Turbo output. 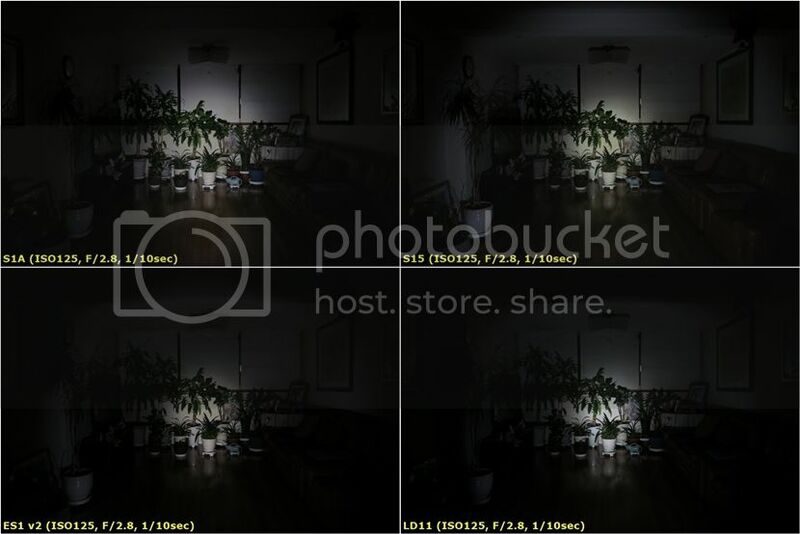 There are additional automatic step-downs in output as battery power depletes. 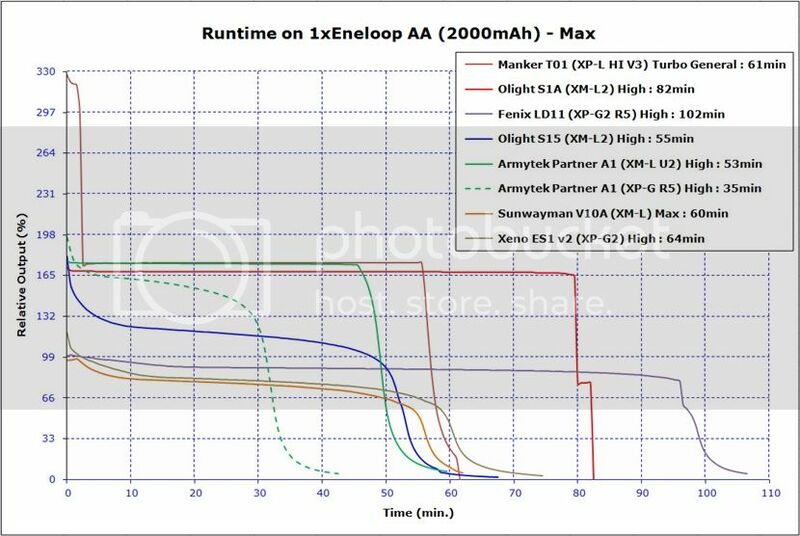 On High with 1xEneloop AA and 1xOlight Lithium AA, the light maintains almost flat regulation for an extended period, before step-down in output as battery power depletes. 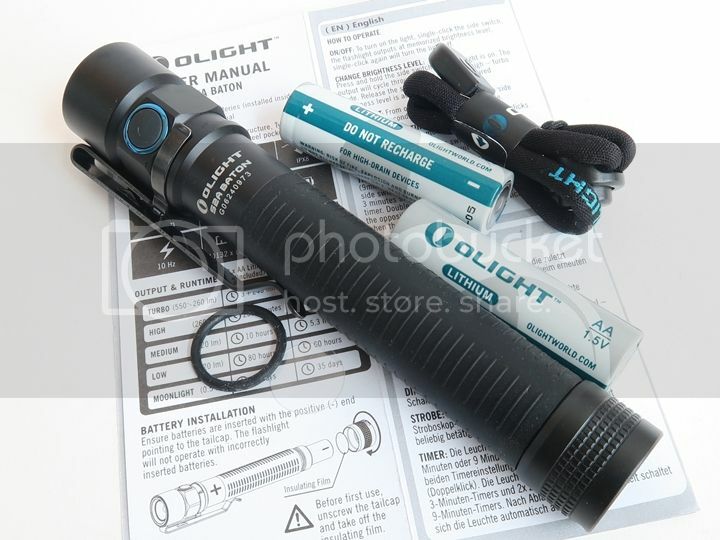 There are abrupt shut-off on both Eneloop and Olight Lithium at the end of runtime. It seems the light has over-discharge protection function and it turns off automatically at voltage of around 0.8V. 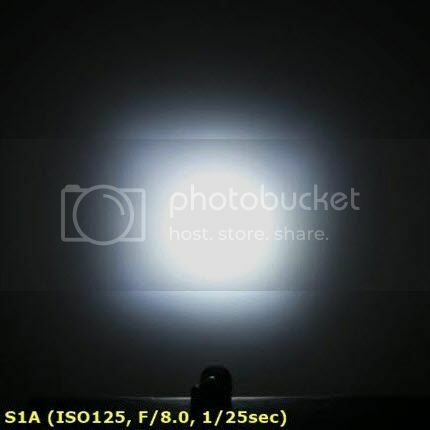 This menas the S1A has a built-in over-discharge protection function in the light. 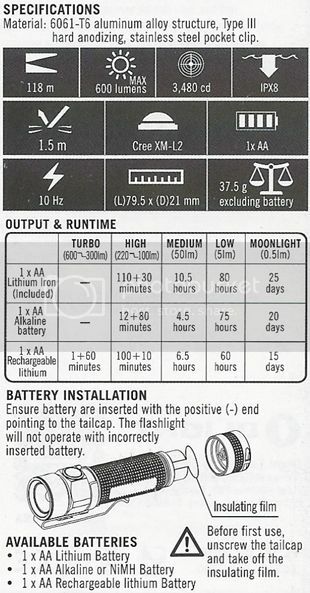 As you can see the above, the light on rechargeable 14500 will give you more than double output than on other batteries at initial runtime. 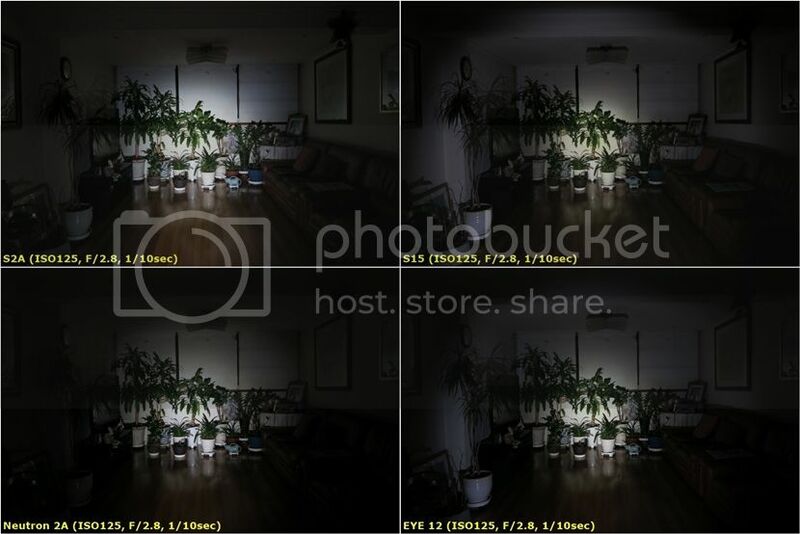 Output-runtime efficiency seems excellent, as expect for a current-controlled light. 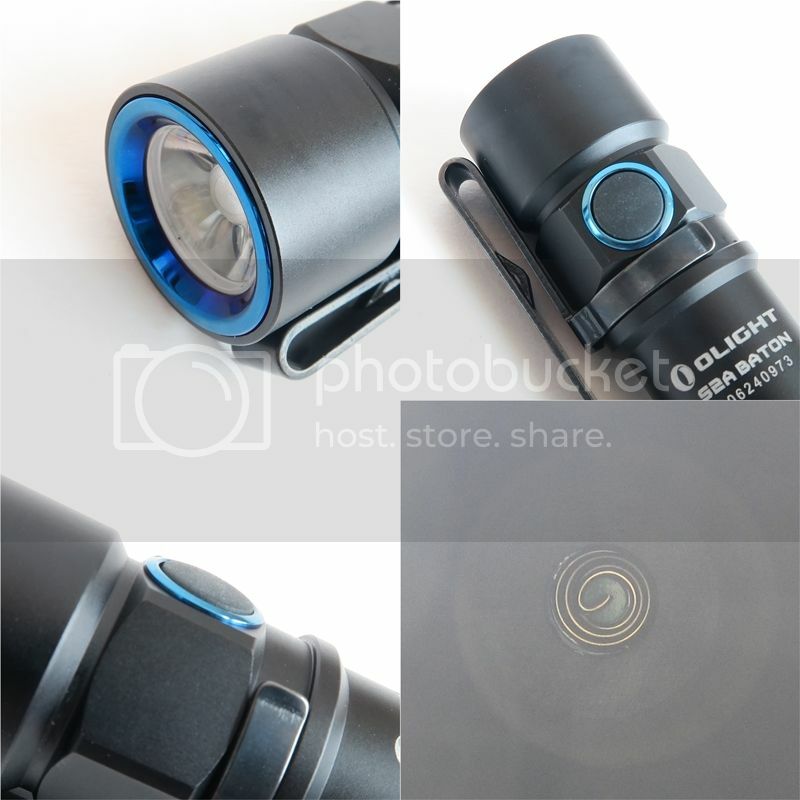 The TIR optic gives you a well focused bright hot spot with a quite less bright spill which isn't perfectly circular, due to TIR optic at a very close distance (i.e., around ~50cm). As with almost optics, there is little side spill. The overall beam profile is better than expected. 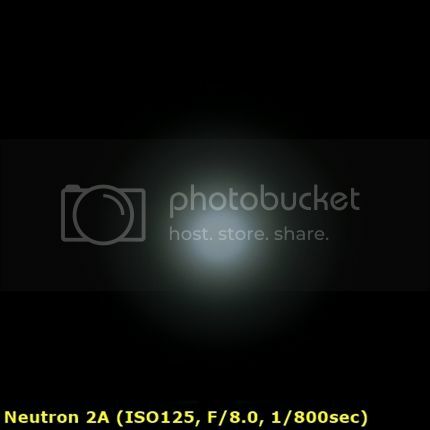 The beam is close to neutral tint in my sample. 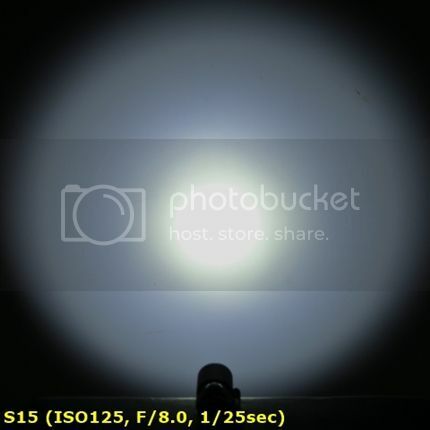 Overall beam profile and tint are quite similar to the S1. The hot spot is wide and well focused for throw. Instead the side spill is minimal. 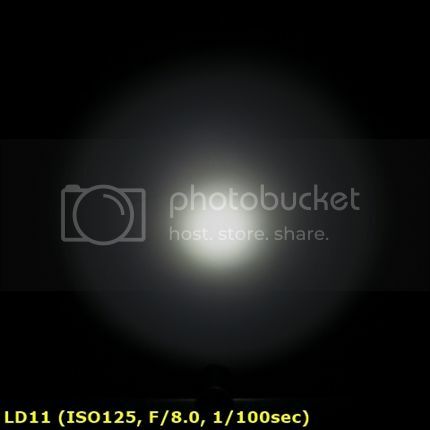 Moonlight mode shows a very nice lower low output level. The S2A comes in clear plastic container. 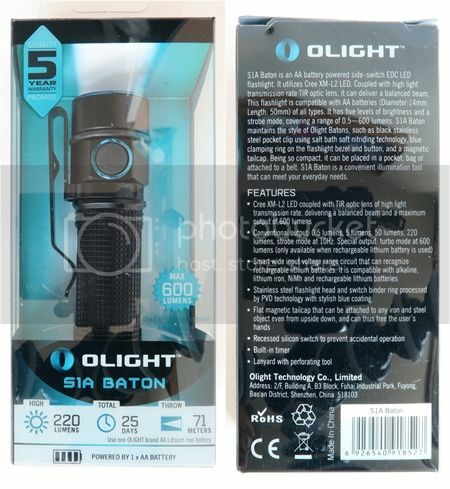 There is an overview of specifications and features on the front and back of the packaging. 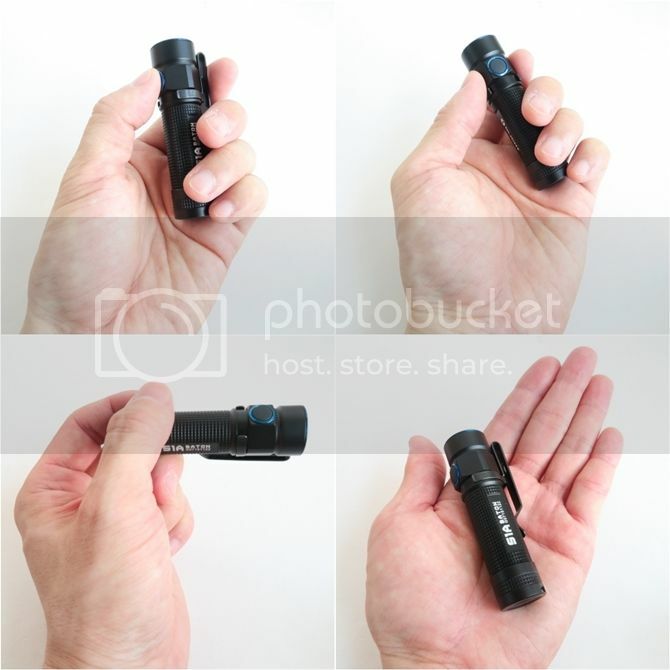 The light comes with removable pocket clip (attached), spare o-ring, wrist lanyard, 2xOlight lithium AA batteries, user manual. • Controlled by a thermal protection program. Tthe turbo mode is limited to 3 minutes. The brightness will gradually step down to the next level. 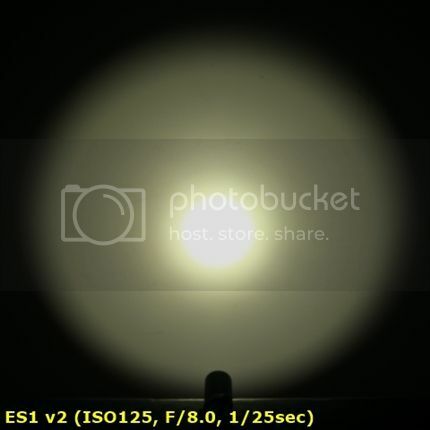 The flashlight will need to cool down to access the turbo mode again. The S2A is compact for its class. 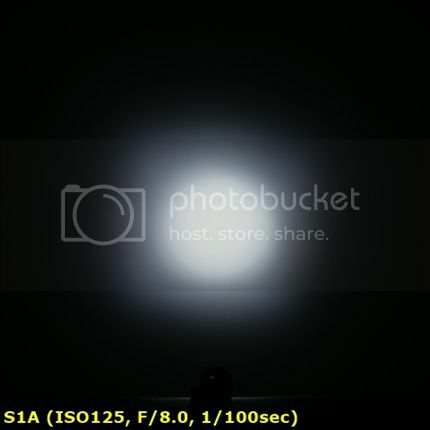 Overall build is quite similar to the S1A. The hard(type III) anodizing is a matte black and no flaws on my sample. All labels are sharp and clear in bright white against the black background. 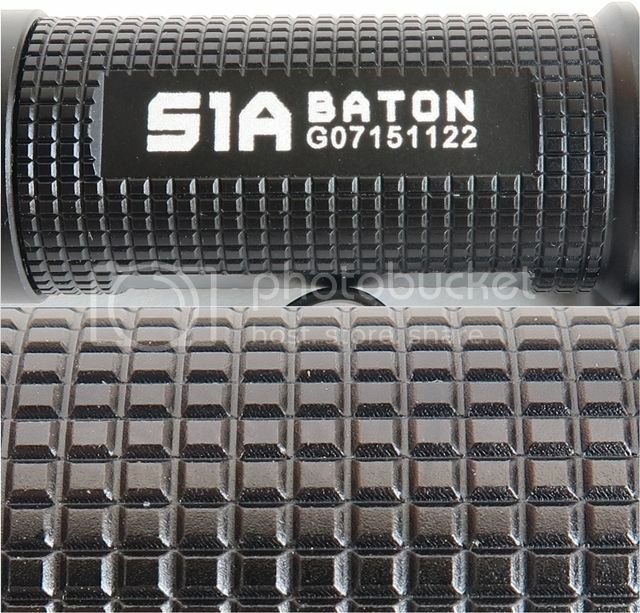 The whole battery tube is wrapped in a soft silicone for a good grip. 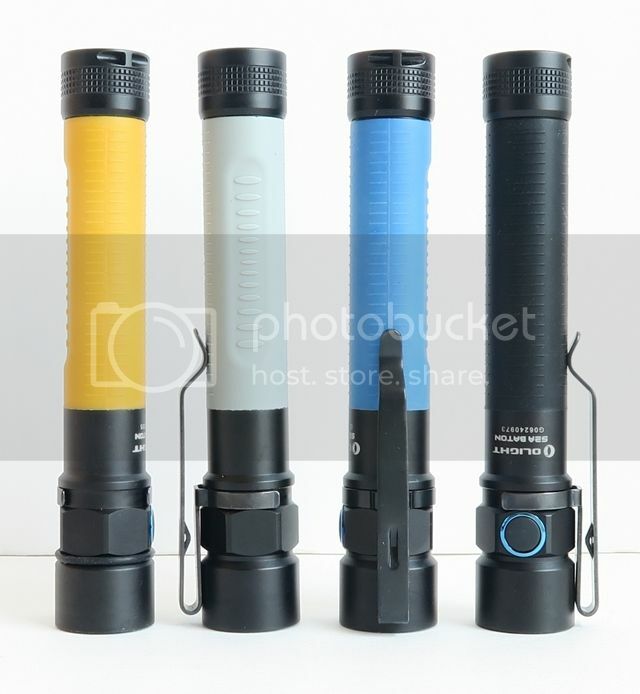 This silicone comes in four colors (i.e., black, yellow, blue, gray). 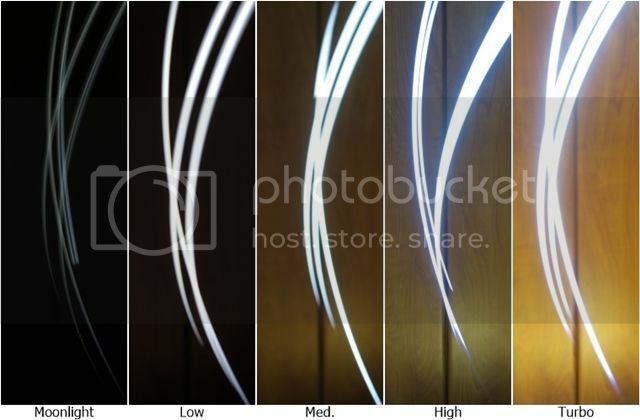 Note that yellow, blue, gray color are all florescent. The light has no tail switch. Fit and finish look very good. 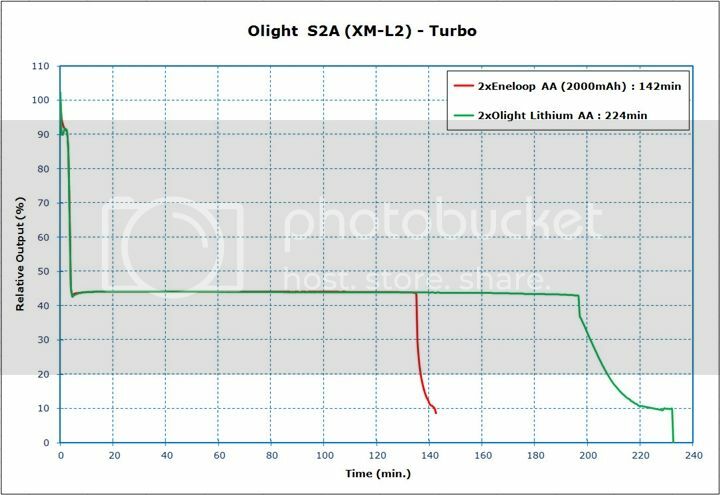 You can use 2xAA (1.2V Ni-MH or 1.5v Alkarine or 1.5V Lithium in the light (i.e., not available with rechargeable 14500 cell in the light). 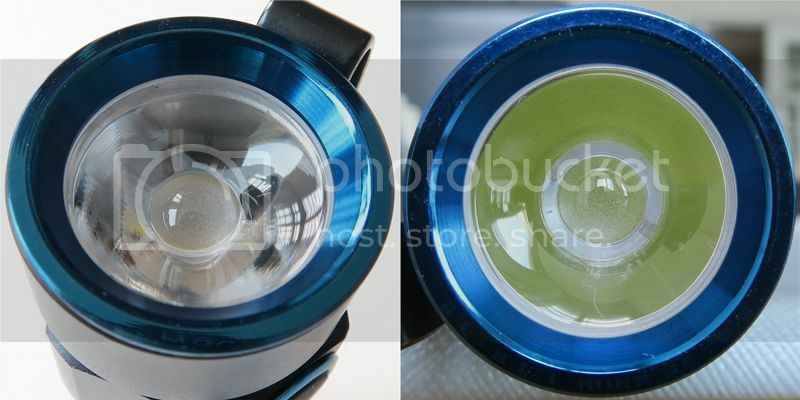 The light has a blue flat stainless steel bezel ring. The head has a clean looking cylindrical design with a hex-shaped neck which provides grip. There's an electronic side switch just on the neck. The side switch is silicon, and it has a good feel to touch and has short travel, which produces the same clicking sound as the S1A. Like the S1A, the S2A switch protrudes slightly, so the risk of accidental activation is not high. There's no low-voltage warning indication on the side switch. The light has a positive (+) battery contact spring in the head. 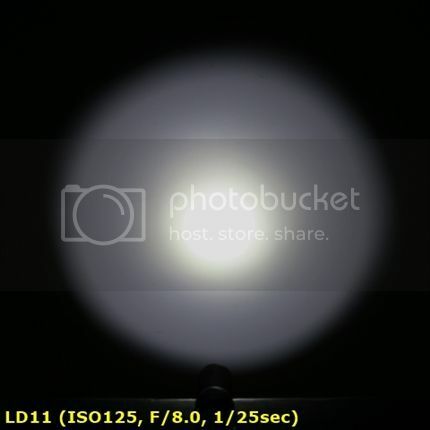 The light has an electrical reverse-polarity protection feature to protect from incorrect battery installation. So flat-top cells will work in the light. 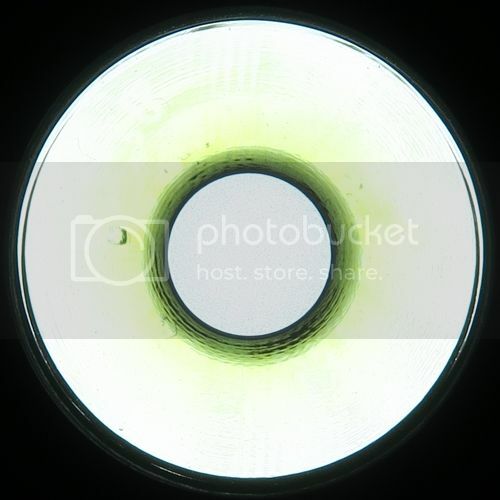 The battery tube is wrapped in a soft silicone with narrow concentric ridges and a flat face. With the pocket clip attached and other shapes on the head, overall grip is excellent. The wall thickness of the body is 2.2mm including the silicone cover. The light feels solid. 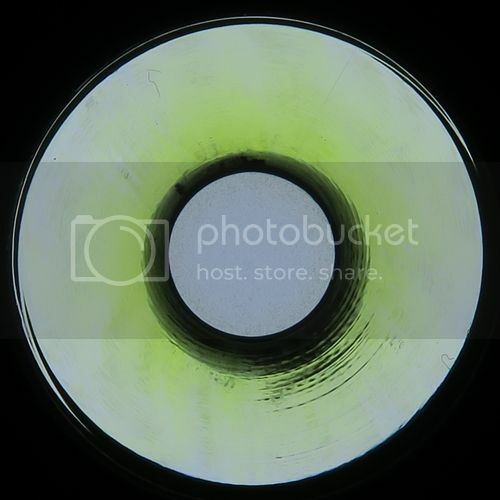 There is a removable negative (-) spring in the tailcap. 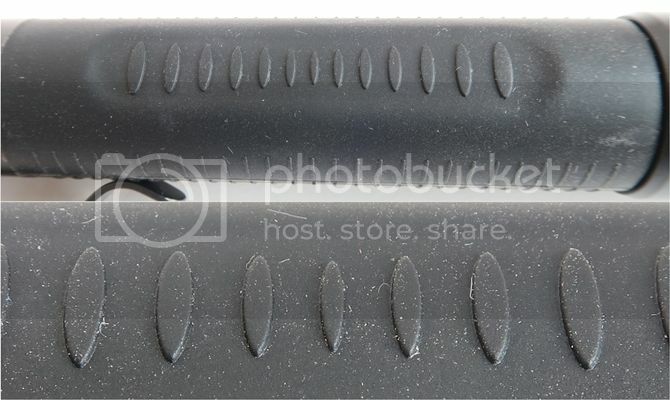 There is tiny hole on the side of the tailcap for lanyard or split-ring attachment. 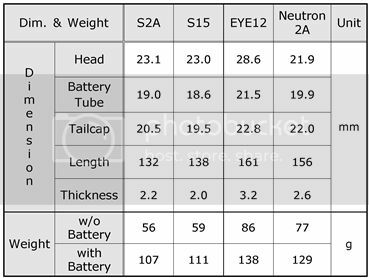 Unlike the S1A, the S2A doesn't have a magnet on the inside of the tailcap. There is a raised checkered portions band on the tailcap. The S2A can tailstand stably. The S1A and S2A have the same UI. 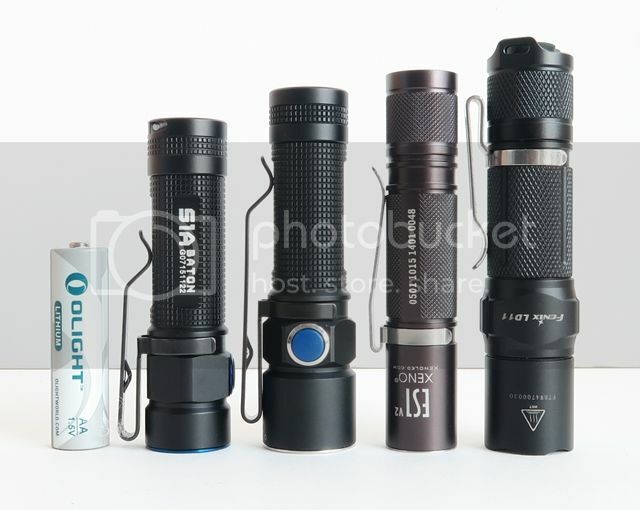 From left to right, Olight Lithium AA, Olight S2A (XM-L2), Olight S15 (XM-L2) with extender, Thrunite Neutron 2A ( XM-L), Niteye EYE12 (XM-L U2). 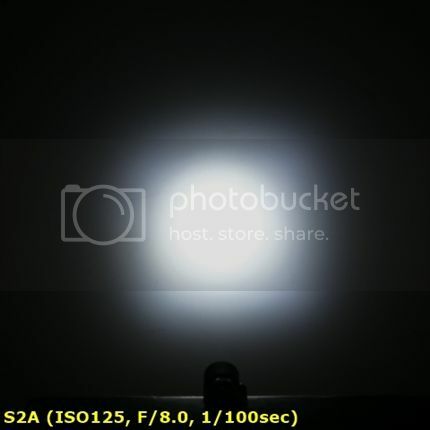 Due to the electronic side switch interface, the S2A is drawing a small current when the light is fully connected. 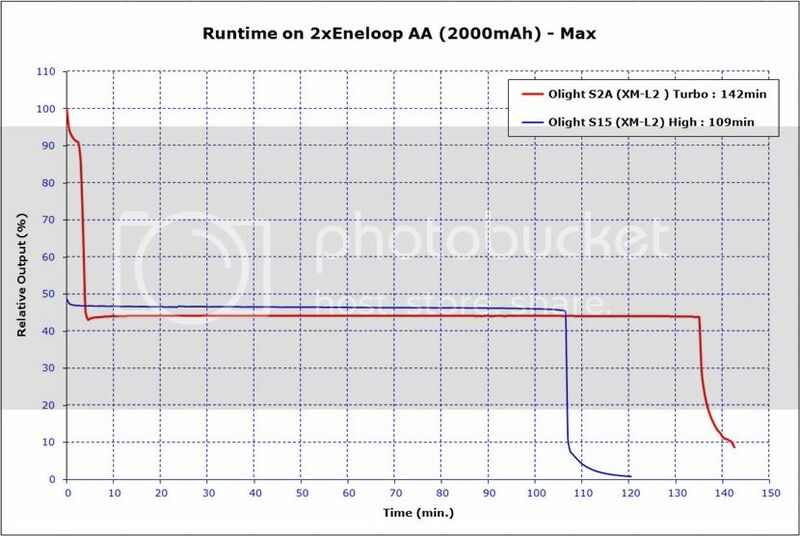 I measured this current as 1.2μA on 2xEneloop AA (2000mAh). That would translate into around 190 years before it would be fully drained. This is quite negligible, not a concern. But I would recommend you to store the light locked-out when not in use for a long time or to prevent accidential activation. The S2A is compact and lightweight. It is good size to hold and use. 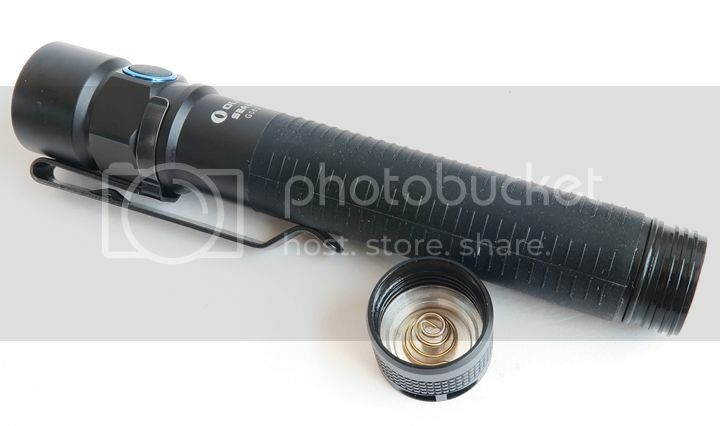 You can use it as an 2xAA EDC light. Overall build quality is excellent. S2A starts to step down gradually after 3 min runtime, and level off to around 44% of the initial output after 1 mins on 2xEneloop AA and 2xSoshine 14500. This seems to be a timed drop-down, not a thermal sensor feature. You can turn the light off-on to restore initial Turbo output. 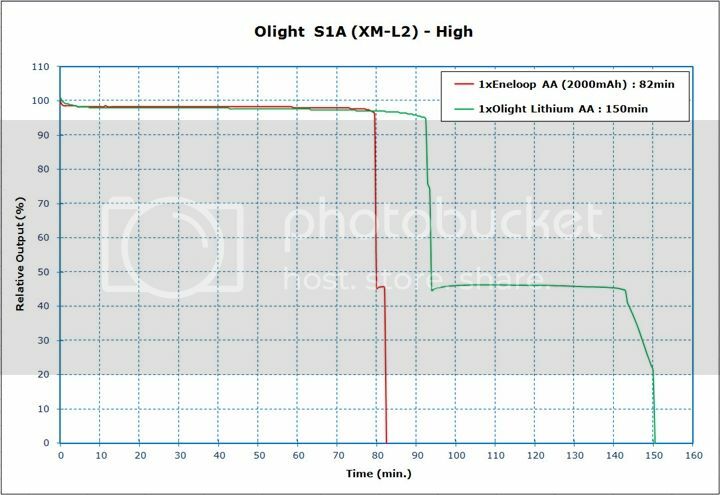 There are abrupt shut-off on Olight Lithium batteries at the end of runtime. I forcibly terminated runtime test on Eneloop to protect over-discharge of the cell earlier. Like the S1A, it seems the light has over-discharge protection function and it turns off automatically at voltage of around 0.8V. 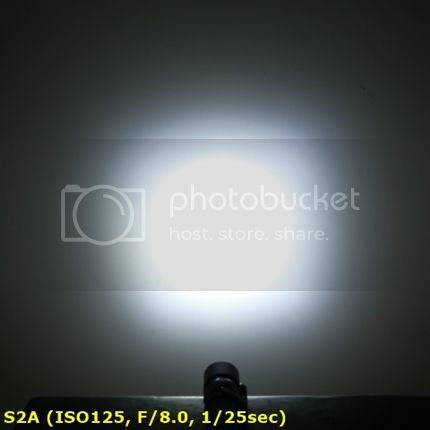 This menas the S2A has a built-in over-discharge protection function in the light. Output-runtime efficiency seems good, as expect for a current-controlled light. 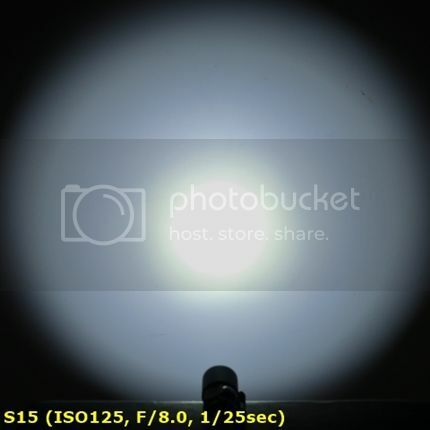 The TIR optic gives you a well focused bright hot spot with a quite less bright spill which isn't perfectly circular, due to TIR optic at a very close distance (i.e., around ~50cm). As with almost optics, there is little side spill. The overall beam profile is better than expected. 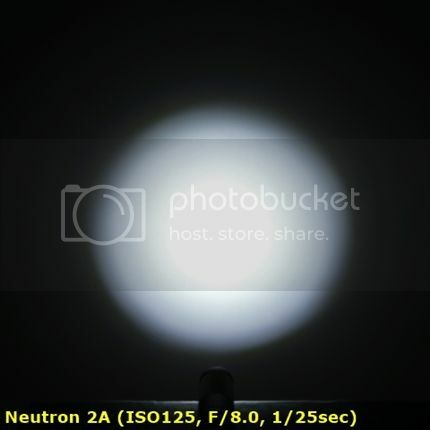 The beam is close to neutral tint in my sample. 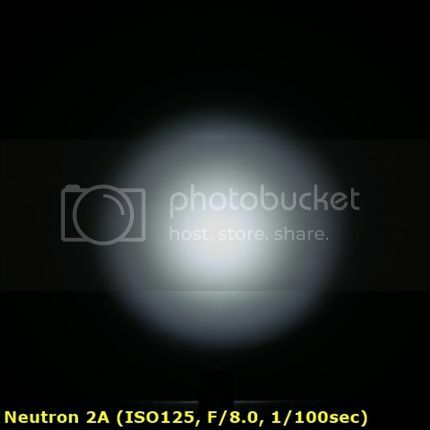 Overall beam profile and tint are quite the same as the S1A. Moonlight mode shows a very nice lower low output level, but brighter than the S1A. 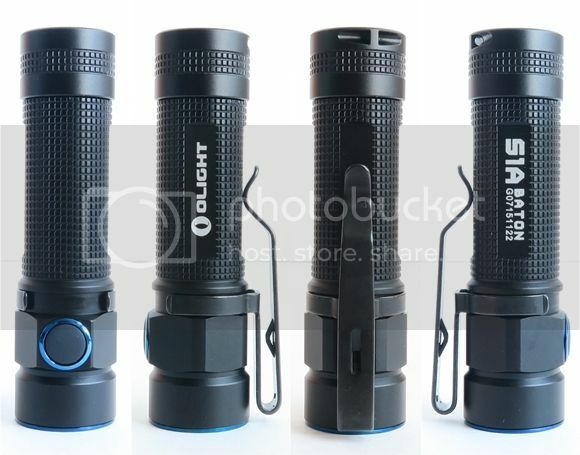 The Olight S1A and S2A provided by Olight for review. после обзора заказал s1a, как раз хотел брать s1, но смущала его толщина, плюс не самое распространенное питание, а тут прямо плюс на плюсе (в прямом смысле этого слова) - плюс там где должен быть. взял на али, цена 2400. Был S15. Кажется сломалась кнопка - не включается. По гарантии предложили прислать S1A. Получил - совсем детский размер, кнопка стала резиновой, меньше рефлектор стал. К сожалению дополнительный батблок от S15 нормально не накрутить. Никто не знает есть на него батблоки? И я так понимаю что 14500 сильно не улучшит характеристики? Вчера приобрёл данный фонарик, впечатления положительные. Брал с нейтрально белым светом. Понравилось всеядность малыша. На 14500 светит довольно ярко. Сравнивал с S2. В общем покупкой доволен.